These babies are soooo good and addicting!!! Are you all ready to enjoy Thanksgiving? Hubby and I have so much to be thankful for. We are really looking forward to spending the day with family. Although, this will be our first Thanksgiving without our son... (sad face) But, I'm thankful he will be coming home for Christmas for a whole week!! Anyway... I had such wonderful plans for these delicious delights. I intended to serve these to my book club ladies, but I didn't have enough time to finish them. Yet... my family has definitely enjoyed them! Five ingredients... Opps! I forgot to put the white chocolate chips in the picture. You'll need those. I ground the cookies in my mini Cuisinart. That little thing definitely gets a workout in my home! Then I dumped everything in to my mixer. I added 2 tsp. of Pumpkin Pie Spice. Plus about 4-5 drops of yellow food coloring and about 3 drops of red food coloring. Blend til smooth, and refrigerate for 30 minutes. Then roll into 1 inch balls. I made about 36 of them. Chill again. Then melt your white chocolate chips in a small bowl in the microwave about 30 seconds at a time until smooth. I discovered a wonderful trick this time! I used coconut oil to thin the chocolate. If you didn't know, coconut oil is solid at room temperature, but add a little heat and it quickly turns to liquid! 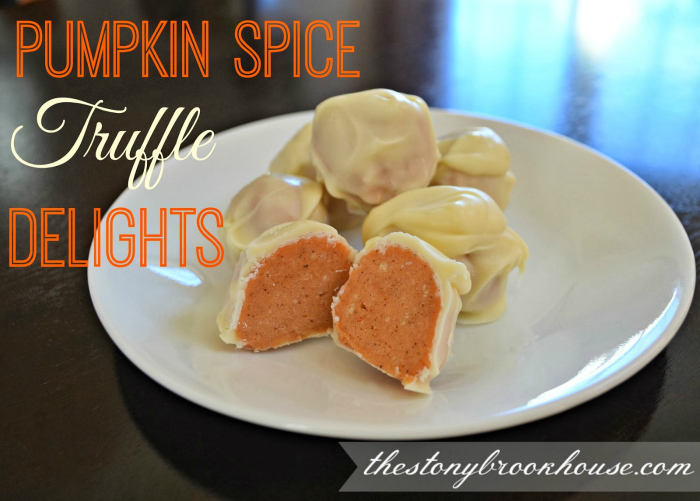 Lightly coat the pumpkin balls with white chocolate, then chill again in the refrigerator. 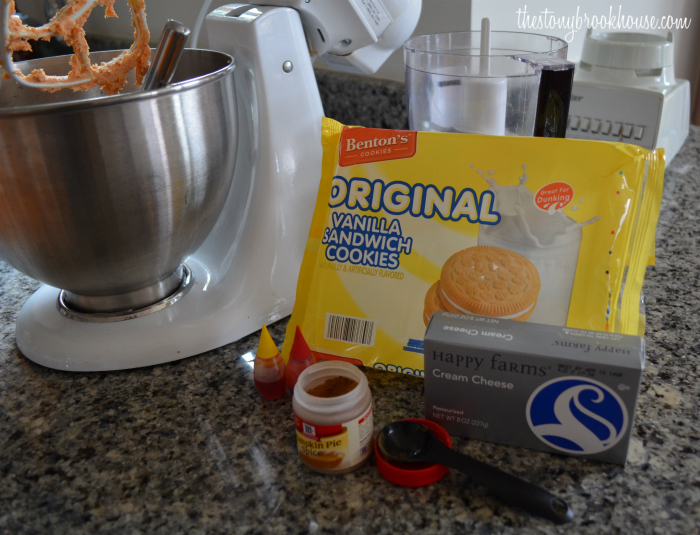 Grind up vanilla sandwich cookies. 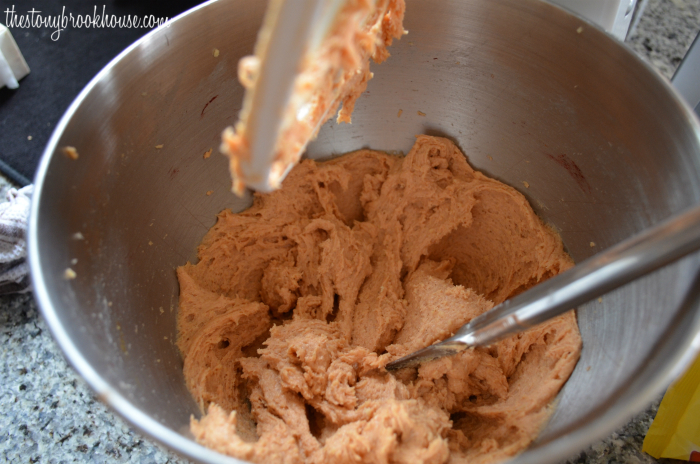 Add cream cheese, pumpkin pie spice, and food coloring. Roll into 1 inch balls. Then chill again. Melt white chocolate chips in a small bowl in the microwave for 30 seconds at a time, until smooth. Add coconut oil to thin the chocolate until desired consistency. Using forks to roll pumpkin spice balls in chocolate. They are soooo good!! Enjoy!